What thoughts may have crossed the Russian pilot's mind, when he was the first to spot the dark abyss in the ground from the cockpit of his helicopter? A black hole of about 30 metres in diameter gapes in the middle of the treeless wasteland of the North-Siberian tundra. Did a meteorite hit the site? Is the crater the result of a volcanic eruption or did aliens do this? The discovery on the Yamal Peninsula has triggered questions amongst geologists. How did the mysterious crater originate? Why there in the tundra of all places? One thing is certain: the crater was formed not long ago. The smooth walls in the frozen ground are suspicious, as is the freshly raised earth mound surrounding the crater and the ice at the bottom of the approximately 70 metre deep hole. Inside the crater, Russian scientists have measured unusually high concentrations of methane. "Everything indicates that the crater has been formed by excessive pressure of methane gas", thinks Hans-Wolfgang Hubberten, Head of the Research Unit Potsdam of the Alfred Wegener Institute (AWI), Helmholtz Centre for Polar and Marine Research. Climate change might have a part in this. The peninsula's several hundred metres thick, permanently frozen ground has been warming up over the course of about three decades. Exceptionally warm summers, such as lately in 2012 and 2013, accelerate the process. 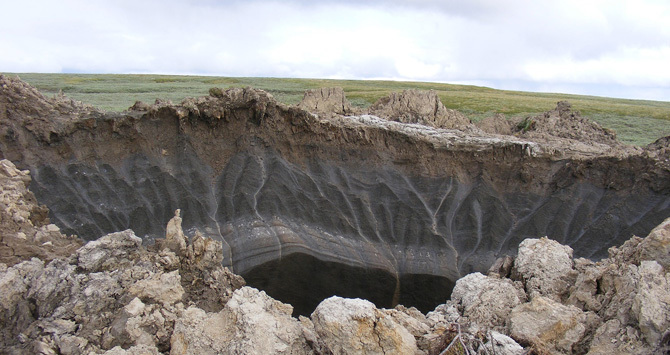 When the permafrost soil thaws, this has consequences, says Hubberten. The frozen water of the permafrost soil contains huge amounts of methane. In combination with water, it forms methane hydrate that is stably bound in the ice. Yet when the ground warms up and the ice melts, methane is released. It expands, sometimes to 150 times its original volume as a hydrate. A huge gas pressure is the result. If this pressure becomes too much, the same happens as with a pressure cooker. The lid flies off in an explosion and the pressure is discharged. But where does the gas in the ice come from and why does it break free from the ground in North Siberia of all places? "To understand this, we have to look at the region's geology", says Bernhard Diekmann from the AWI. About 280 million years ago, the region around the Yamal Peninsula was subject to strong volcanic activity and earth movement. The region sank down and was filled by marine deposits of several kilometres in thickness. Decomposition processes and heat created natural gas at the site, which now forms huge gas fields thousands of metres deep in the ground. Its main component is methane. Gases from these deposits seep upwards along fault zones. The permafrost soil, however, seals them off. They are enclosed in the ice in the form of gas hydrate. When the ground thaws, released gas pushes upwards through gaps. The crater in the tundra is located only 30 kilometres from the Bovanenkovo gas field and it does not seem to be a unique phenomenon. Reindeer shepherds in North Siberia have discovered two more craters in the permafrost soil. Could discharges of this nature become more frequent in future? The AWI researchers are unanimous that this could well be the case, if the permafrost soil thaws. Yet to what extent is hard to predict so far. Even so, gas eruptions could constitute a hazard for the settlements in the region and in particular for the nearby Bovanenkovo gas field. The Russian research team has therefore suggested relief drilling to reduce the gas pressure below. Hans-Wolfgang Hubberten is sceptical: "We don't know how big the total gas hydrate deposits in the region are and equally we don't know how much methane has already been escaping through cracks in the ground without anybody noticing so far." Also, monitoring of ground movement per satellite is likely to be difficult. The thawed permafrost soil often is far too soft and muddy. In the opinion of Bernhard Diekmann, a sensible measure would be the targeted monitoring of regions displaying geological faults. It could be that these areas are subject to stronger discharges. This would prevent neither gas eruptions nor earthquakes, but at least one could warn the people living in the affected areas ahead of time. Methane is a highly potent greenhouse gas. Hans-Wolfgang Hubberten thinks that the effect of methane discharges on climate change is currently hard to assess. "But even if these incidences were to increase in frequency, the additional amount of methane being released into the atmosphere would be comparatively small compared to other sources." Massive cattle farming, flooded rice fields and even the gas being naturally released from wetlands have a far greater effect, he reckons.